Bella Pools trained pool professionals are equipped with the latest and best pool service tools and knowledge to help you get your pool ready for the upcoming season. We know that as the warm weather sets in, you and your loved ones are anxious to start your summer off with a splash. Why let your busy schedule keep you from FUN? 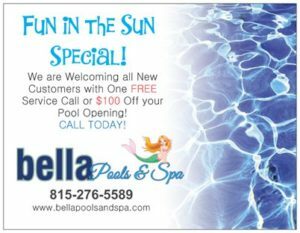 Bella Pools provides you with premium pool opening services! From removing your pool cover to emptying all piping and areas of debris, we can take care of all of your pool opening needs! What’s Included in your Pool Opening Service? Removal of all Plugs, Etc. Need a New Pool liner or simply update your pool with new tile or fresh paint this year? We can help you with that too. Take a look at our Gallery of just some of the work we have done. We can quickly get your pool renovated, repaired and looking beautiful fast and affordably. Our company is focused on delivering superior service and great value on every job big or small. Please feel to contact us with any questions and mention this post for $100 OFF pool opening services. McHenry County, Il, Lake County, Il, Kane County, Il, Cook County, Il.